Winter Break—It’s Not Just for Homework Anymore! With kids all over the United States settling into their long-anticipated extended winter break, many are already starting to dread the mountain of homework they are expected to complete before it’s all over. Not so, for students of The New Century School, who are getting an actual break and will consequently return to school January 5th recharged, reinvigorated, and, most importantly, ready to learn. TNCS isn’t against the idea of homework per se, but it certainly opposes assigning homework that doesn’t fulfill a specific, measurable purpose. And that’s precisely the problem with so much of the homework that faces U.S. students right now—it’s assigned automatically, with little thought given to how it might actually benefit the student. The debate about the merits (or lack thereof) of homework is not new. Books (e.g., The End of Homework, The Homework Myth, and The Case Against Homework) and films (e.g., Race to Nowhere) have argued for several years that homework takes away precious family time and stresses kids out. Yet, the pile of homework continued to grow for American students as young as age 6—in fact, double, from decade to decade until it stabilized around 2003—while downtime was whittled away to next to nothing. Is this an effective way to help children become better learners and thinkers? In “Kids in the US do a lot of pointless homework,” two charts demonstrate the inverse association between the amount of homework done by U.S. kids versus their performance on international standards. It’s not a pretty picture: Although U.S. students spend among the highest number of hours doing homework, they score lower in math. American students spend among the highest number of hours on homework, according to the Organization for Economic Cooperation and Development. Unique to the United States, doing more homework correlates with lower math scores, according to the OECD. As for interfering with what kids would rather be doing? Hardly. TNCS elementary students might spend a few minutes each day journaling about all the fun ways they spent their much-needed and well-earned break. TNCS Elementary Information Night Rounds Out a Great 2014! 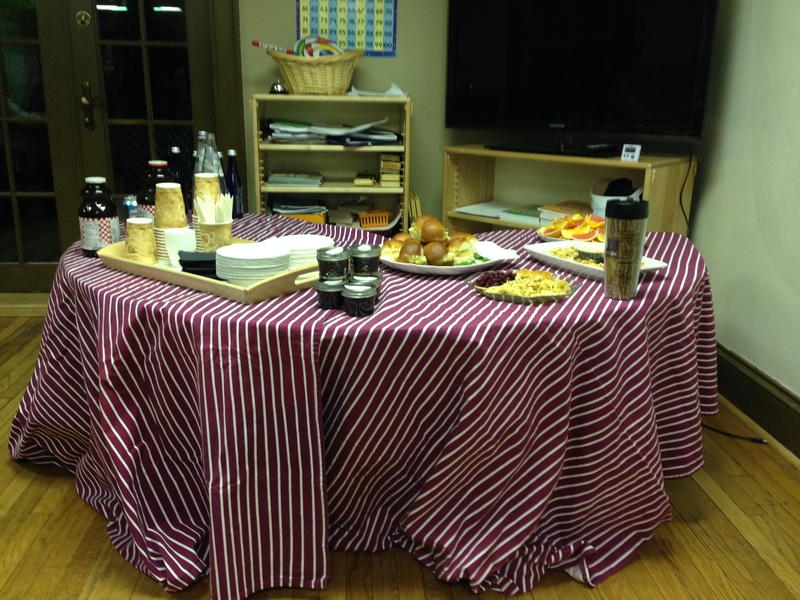 Refreshments were thoughtfully provided by Chef Emma Novashinski. The New Century School‘s fifth year has been undeniably amazing. Rounding out 2014 with yet another breakthrough, Admissions Director Robin Munro announced Thursday that TNCS received a record number of K–5th applications by the 12/17/14 due date. That TNCS’s elementary program has earned its bragging rights—and is attracting hordes of new enrollees—was made clear at the Kindergarten/Elementary Information Night held 12/11/14. The event was well organized, informative, and fun. Yummy refreshments were provided by Chef Emma Novashinski (who also gave away lovely little jars of homemade pickles), and free childcare including dinner was also offered. Recognizing that parent involvement is vital to student success, TNCS makes it so easy—no, appealing—to participate in school functions. Small class size: Keeping classes to no more than 16 students allows for individualized, differentiated instruction. Daily language classes in both Mandarin Chinese and Spanish: Younger students begin with conversation and vocabulary building. As their written English language skills progress, they begin to work on reading and writing in Spanish and Mandarin Chinese. Introductory character work in Chinese begins immediately. 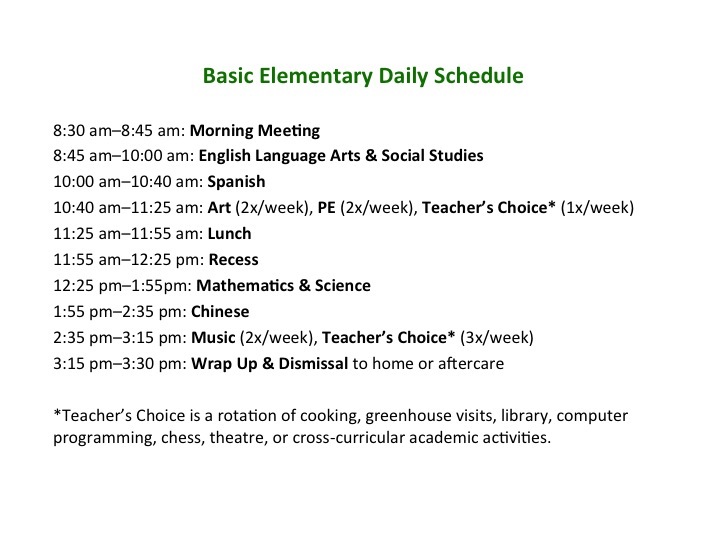 Specialty classes: Students have music, art, and physical education classes twice every week. Creativity is encouraged through music and art, while body awareness and health is taught in phys ed class. Inquiry- and skill-based curricula: We provide a solid foundation in the core subjects of language arts and mathematics, and our teachers develop auxiliary science and global studies lessons based upon student questions and interest. This approach encourages critical thinking and allows children to work to their fullest potential. Field trips: Teachers take students on weekly trips to our on-site greenhouse and into the school’s extended classroom, lower Fell’s Point. Students take a full-day trip at least once each quarter. Past field trips have included the Baltimore Museum of Industry, the Confucius Institute at University of Maryland College Park, the National Aquarium, and more. Emphasis on values: Students learn to treat others and themselves with respect. Mixed-age classrooms: Students to work to their skill level, not just their grade level and benefit both from mentoring and being mentored. Enhanced learning via technology: Students use children use multiple apps and programs, learn proper keyboarding skills, and begin to learn basic programming. Twice weekly music lessons with the recorder have paid off! See?! Creating art makes kids happy! Releasing some steam on a beautiful late-Fall day! Elementary students not only enjoy mixed-age classrooms themselves, they also circulate among the other programs to mentor younger students. Teacher’s Choice might be just about anything, but it’s always engaging and interactive! Part of The Daily 5 is reading individually. Exploring Fell’s Point—TNCS’s extended campus—is an exciting and enriching part of each TNCS elementary student’s school experience. After the initial gathering, parents were asked to “self-sort” (love that new term coinage!) into three groups and rotate among the three elementary classrooms. In his classroom, Dan McGonigal, the upper elementary mathematics and science teacher, demonstrated a unit on bridge construction in the science curriculum, Engineering is Elementary (scroll below for photos of the students executing this project). Adriana DuPrau, the upper elementary English language arts and social students teacher showcased the English, Chinese, and Spanish curricula. Teresa Jacoby, the K/1st generalist teacher discussed integrating traditional Montessori materials with more progressive curricula and how she differentiates to the various levels in her class. Mrs. Danyali and Mrs. Munro circulated throughout to answer questions. Elementary students learned how to make Family Trees this semester . . . then mad etem in both Spanish and Mandarin! As an independent private school, TNCS does not follow the Common Core standards. Individual grade standards set forth by the Maryland State Department of Education are met—and in most cases surpassed—through the use of carefully selected curricula which best supports our mission to challenge students to realize their richest individual potential through progressive, multilingual education and meaningful participation in the world community. Students are placed according to their birthday into one of three mixed-age classes: K/1st, 2nd/3rd, and 4th/5th. As the student body matures, upper grades will be added (through 8th) each year, accordingly. Mixing ages is part of the school’s Montessori-inspired vision. Research continues to prove what Maria Montessori observed over 100 years ago, which is that children learn best from their peers. By mixing ages, students can work to their own skill level and not be boxed in by grade-level expectations. TNCS students learn to be friends with everyone and to solve social problems without aggression. A day in the life of a TNCS elementary student. Looks pretty engaging! The TNCS format of mixed-age, skill-based classrooms allows our teachers to truly teach and inspire students to reach, or more typically exceed, grade expectations. Through inquiry-based lessons, TNCS teachers can educate the whole child and are not limited by the constraints of a standardized test. Tools they use to help accomplish these goals include the following. The Daily 5 consists of reading to self, reading to someone else, listening to reading, writing, and doing word work. Junior Great Books brings high quality literature and student-centered discussions to the classroom. Wordly Wise 3000 improves student vocabulary. Singapore Math is the backbone of the mathematics program. Montessori math materials are used in the K/1st classroom to provide a solid foundation for the transition into Singapore Math in upper elementary. The Daily 3 consists of doing math individually, math writing, and doing math with someone else. Engineering is Elementary allows for learning scientific principles through hands on experiments. The photos below show an example of one project in the bridge design unit. The budding civil engineers worked cooperatively to create a 12″-long bridge that a “barge” could pass under. The students calculated the cost of materials and construction to help measure effective design. They tested the bridge for strength by placing pennies on top. Now that’s something to brag about, kids! And keep up the great work, TNCS! TNCS’s Winter Performance Amazes and Delights! The 2014 Winter Performance was stunning! The New Century School‘s 2014 Winter Performance was unanimously voted Best Ever by a rapt, proud, overflowing audience! 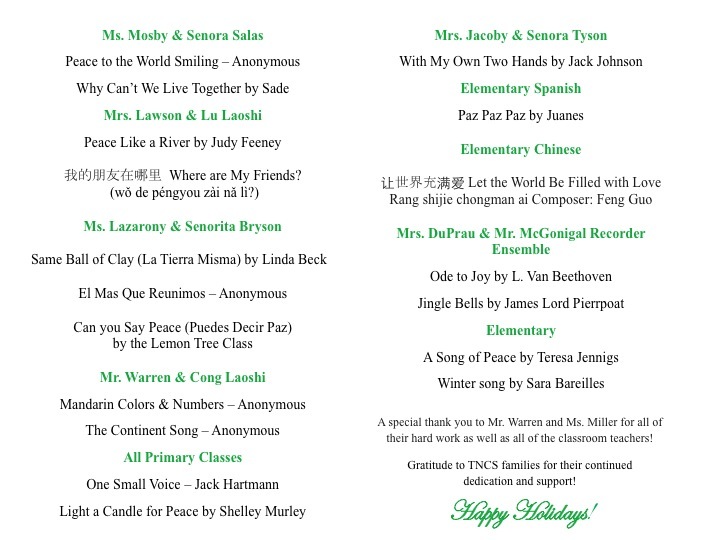 The motifs of peace and love provided a unifying theme, appropriate for the season and for TNCS’s spirit. The success of this year’s performance is due to a combination of factors, including the continued tremendous dedication of TNCS staff, the heartbreakingly adorable performers, and the simply amazing TNCS families. Other differences this year also made for big pay-offs. Performers stood on bleachers so all were easily seen and heard from the audience. The event was limited to the primary and elementary classes, and although the pre-primary toddlers were certainly missed, the event was more manageable in terms of time and efficiency with just the older students. A new time was also road-tested, but what timing works best for most families is yet to be determined. And then there were Mr. Warren’s touches of brilliance—he had the elementary students perform “Ode to Joy” on recorders as well as led the entire auditorium through an interactive rendition of “Jingle Bells” https://blogthenewcenturyschool.files.wordpress.com/2014/12/jingle-bells.m4a with audience participation. He chose to reprise “Winter Song,” and the dewy-eyed audience was not sorry to hear that lovely song again. Finally, he ended the show with a happy surprise by debuting his original composition, “The New Century School Song,” which primary and elementary students joined together to sing. The 2014 Winter Performance was the ideal way to close out the first semester of TNCS’s remarkable fifth year. Well done, TNCS community, and Happy Holidays! The New Century School has accomplished sheer marvels in its 5 years. The once tiny one-room school has grown into a full-fledged preschool and elementary school with a middle school on the horizon, and, with the expansion, the student body has increased apace. Milestone after milestone has been sighted, then met, including launching a greenhouse and school-lunch program, acquiring a gymnasium and auditorium; implementing a robust STEM curriculum; introducing Immersed; earning a coveted STARTALK grant; and creating a wonderfully rich education that integrates the arts, modern world languages, inquiry-based learning, and self-motivated discovery. The TNCS community is responsible for these remarkable achievements, from the school co-founders/executive directors who first brought their visionary education ideas to fruition; to the amazing staff with an incredible range of individual talents and skills, not to mention devotion; to the students themselves, who both illuminate the school with their unique personalities and benefit enormously from what they take away. And there’s another essential piece of the TNCS community who shape, and are shaped by participation in, this group: the TNCS families. The level of parent involvement means that education is a family affair, with parents and children sharing the process and therefore maximizing its efficacy. It also means that the school is an extension of home—it’s a place where children want to be. Mrs. DuPrau and her elementary students. In the greenhouse . . .
Mr. Warren and The Gang! Yet another achievement has grown out of the collaborative efforts of school administration, staff, students, and families: TNCS has launched a vibrant new website made up of all of these invaluable contributions. To put it simply, the website is beautiful because it reflects the school. This blog post is not only an official announcement that the website is live and ready but also an expression of gratitude to the TNCS community who made it possible. At www.thenewcenturyschool.com, visitors will get a peek inside TNCS as they navigate each informative, helpful page, and current families can attend to school business through the convenient Parent Hub (while drinking in images of their children engaged and absorbed in their day-to-day scholastic tasks). To all of you who contributed your time, your skills, professional expertise, testimonials, photographs—yourselves—THANK YOU! Spend some time getting to know the all-new website, and share with your friends and your family. Please don’t hesitate to provide your very welcome feedback. Most of all, enjoy!